It’s a rare luxury to revisit any theatre production later in its life. More so to see an evolved production. That’s what visiting Angels on Broadway feels like. They are of course the same production…but not. This is a production that has ‘flown home’ and now exists before a home crowd audience. One which knows not only the nuances of the play, but the world in which it lives. Theatre is a living breathing thing, the play we watch on stage is created with the audience. And so, the Broadway production is a unique entity- the same production but different in many respects. In terms of audiences, this is a critical thing to address- both in terms of the play’s place with Broadway audiences and how they engage with it. But I’ve been going to Broadway for about 15 years, and I’ve never seen a play greeted with such rapture as this one. It was more like watching a musical- applause after every scene, cheering at lines, spontaneous applause. And while my British sensibilities meant I couldn’t help but mutter ‘he hasn’t done anything yet’ at Nathan Lane’s entrance applause (and giving my own British passive aggressive silent applause for everyone else who didn’t get it…). The audiences know these characters. They’ve come home. And the way they interact with them shapes a viewing of the play. Of course, audiences are audiences the world over and with them comes the…interesting elements of shared experience. From lady behind you recites the Kaddish (and the Kiddish) along with Louis…then declares ‘He didn’t think he knew it, but he did!’ (clearly channelling her inner Ethel Rosenberg). Or the audible gasp, still unclear of joy or horror, when all of Lee Pace was revealed. Or indeed the woman who asked, ‘Did he give him AIDS?’ when Louis wipes the Pepto Bismol from Joe’s face. The latter perhaps proof positive of the continued relevance of this play as education wherever in the world. Changes to the staging come from transposing a piece designed for the National Theatre’s Lyttleton Stage, to a smaller, older Broadway house. The Lyttleton is notoriously one of the most difficult in London to stage on (indeed as an article around the time of Angels production outlined). The stage in New York is smaller, with less of the technical tools the National Theatre has the luxury of, so the staging is naturally adapted somewhat. But it enhances what was already in the design rather than diminishing it. The smaller staging works better in Millennium with the revolving platforms pushed closer together and giving a greater sense of cramped New York living, and the inevitability of ‘revolving’ into each other’s lives. Indeed, in the split scenes where characters cross over and crash into each other’s ‘spheres’ the claustrophobia of their own relationships, and the ‘crashing into’ the worlds of another feels far more effective. And while the same ‘pulling the rug away’ effect isn’t quite had as the existing set moves back, for the end of Millennium the exposed stage floor starts the theatrical unravelling, while the literal messy sets of Perestroika again work well on the smaller stage, piling on and falling over each other as things unravel. The changes may have been logistical in some respects, but they work with the feel of a production whose design is as integral as its performances. The biggest artistic tweaking however is the ‘Heaven’ scene. Still drawing on the theatrical imagery/metaphor that runs through this final act of the play, ‘Heaven’ is more elaborate, more deliberate than in London. Where in London there were bare walls and the far off reaches of the Lyttleton, here a velvet curtain parts admitting Prior to Heaven. Resplendent in his robes, it’s fitting he parts the curtain bathed in warm light before entering the starkness of the Angels’ Council Room. While the London staging worked well here, this is an instance of the re-staging elevating this scene. 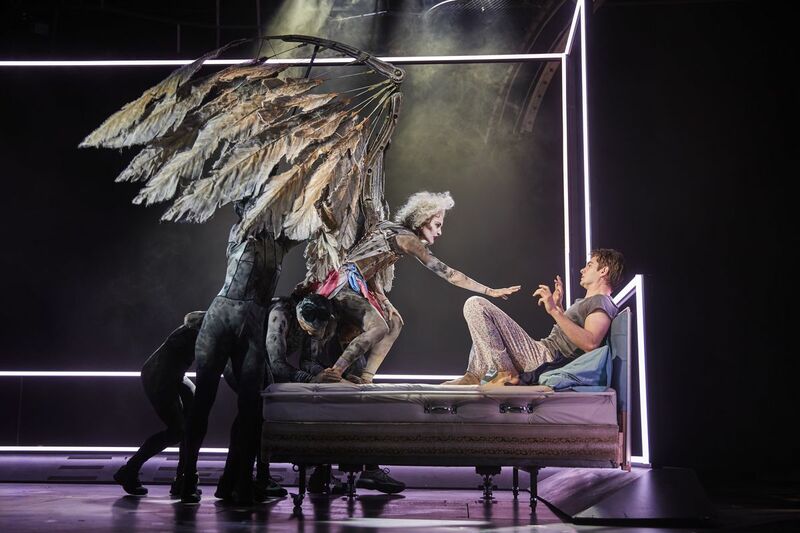 The sense of the theatrical-the meta-theatrical that is running through the scene is made resplendent- and fittingly for Broadway through these changes to staging. Above all what Elliott and the design team do to the restaging is retain the essence of the play that was built from the ground up, and while adapting to its new space adapt and augment the visual identity of the piece. Considering the staging- and re-staging is critical, as the visual identity was so key in this production’s re-defining elements of the play. Elliott’s ending, with theatrical visual layered on theatrical metaphor is as important a visual signature as the changes to the Angel. Again, reviving a production is rendered useless if in part you aren’t re-writing it. Performances are also tied to their physical spaces, and the changes for the Neil Simon mark this production out as belonging there. That New York holds onto its own personal visual identity in the history of the production is important. This play is wedded also to the theatres it is performed in. In London it grew from the Cottesloe to the Lyttleton. In New York it migrated from the Walter Kerr to the Neil Simon. There is much to be said of the history of the play with buildings, but for now that the previous inhabitant of that theatre was Cats (Singing Cats!) and the next will be The Cher musical, well that’s a fitting epitaph for a revival too. (If somewhat disappointing Nathan Lane didn’t appear on opening night in a Cat costume). In a final note on staging, in the Epilogue, when the house lights come up in the theatre, the grandiose of the Neil Simon theatre, that old fashioned Broadway house really plays into that moment. Sitting in the Mezzanine particularly, you see the lights on the giant chandelier gradually warm up to life as Prior gives his final address. That’s a location specific piece of money can’t buy theatrical magic. The fabulousness of the golden chandelier as Prior bids us farewell, the gilded walls of the theatre. That’s fairly fabulous, that’s very Prior Walter. And of course, let the record show I still curse Marianne Elliott’s name aloud in my head every time that happens, for sheer genius of the moment and because nobody needs to see just how much I’m crying at that point. Key also to the changes in the play are of course the new cast members. Previously sharing the role with original Angel Amanda Lawrence, Beth Malone took over the role full time in May. Malone doesn’t mimic Lawrence’s take on the Angel, and her quirkiness differs to Lawrence’s eccentricities, in a way that retains the essence of the Angel as written, and as directed by Elliott, but allows for the actors’ own personalities. Essential in this other-worldly creature that is difficult to pin down (literally). Malone’s is an energetic, acrobatic and seems to mesh the Angel with some of Nurse Emily’s fast-talking-New-Yorker. 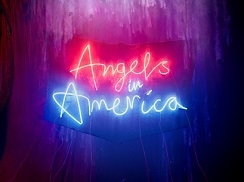 Accompanying Malone are the new Angel ‘shadows’ whose choreography and role has been changed slightly as well. But utilising the strength of New York’s pool of dancers/acrobats has really paid off- the puppetry and movement of the Angel, while sublimely impressive in London really flies with this team of ‘Shadows’ whose career is focused on dance and movement. Malone herself shows herself to be a skilled mover as well and the already impressive puppetry and unique flying of this production is really elevated in their hands. The second addition is Lee Pace as Joe. It’s easy to forget until watching a switch in actor, in an existing production, just how much Joe touches characters across the play, and therefore how much other actors’ performances are influenced. Pace is a softly spoken, gentle actor who inhabits Joe as such. A more stoic, precise Joe as well, he is believable as the lawyer, the consummate politician. There’s a manner in which Pace holds himself that gives Joe a sense of ‘holding in’ and ‘holding back’. Pace plays Joe, it appears more as a man struggling with his sexuality, than Tovey’s version- which appeared to be a take of a closeted man angry at himself. It seems a genuine surprise to him when Louis declares him ‘Confused’. Pace embodies this element too, seeming a man out of step with the rest of the world making him feel he doesn’t belong within it. 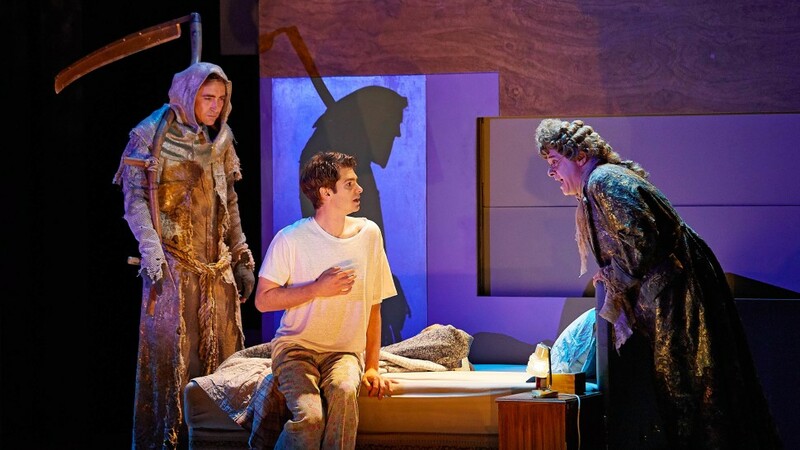 Joe’s character reaches across the play, his performance intersecting and impacting with much of the original cast. 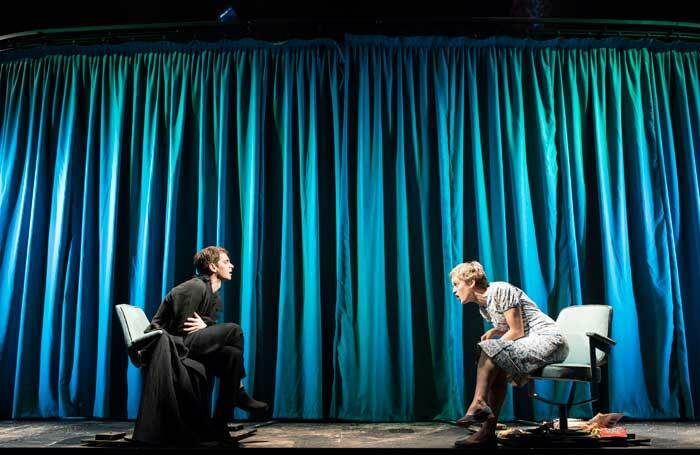 Crucially on Denise Gough, whose Harper is probably the most changed performance from London. While in London there was a searing anger to her performance, off the back of Tovey’s as Joe. Their relationship is less fraught, less angry and ultimately feels more tragic as a result. Gough’s Harper bounces off Pace’s quiet confusion, her anger is a slower burn, brought out of his actions rather than who he is. In early scenes there’s a sense of their character’s equal confusion and fear of life having brought them together. And when Pace says with the greatest of fondness he loved how she was ‘always wrong’ there’s an echo of what once was between them. Joe also intersects with the storylines, and therefore the performances of Nathan Lane’s Roy Cohn and James McArdle’s. And while little can steer Nathan Lane from his performance course, there is a sense of the Joe/Roy relationship tempered by the presence of a quite different actor in the role. There is a fairly sizeable shift to the dynamics of Louis and Joe, parallel really to the shift between Harper and Joe. One that shifts from an amusing, sweet flirtation in which it appears the Joe is genuinely ‘Confused’ to something of a friendship (involving eating hotdogs, which they actually eat. Whoever made that decision thank you). More importantly Pace’s more genteel, naive approach to Joe makes his relationship with Louis ultimately one that is incredibly sad. With Pace they are two lost souls clinging on, rather than crashing into each other. And with their final showdown in the ‘Have you no decency’ scene it’s a heart wrenching thing to watch two men tearing at each other both emotionally and physically because they’ve gone beyond any capacity to do otherwise. Pace doesn’t provide a ‘better’ performance than Tovey did, but their respective Joes serve to illustrate the different interpretations of the character, and the complexities Kushner has written, which also reverberate across the other characters in the play. The rest of the company have of course continued to evolve their performances. A rare opportunity for an actor also to both sit with a play this long, and get to re-stage it after the original run, and all of the company have adapted and grown in their performances and it’s a joy to revisit. Having seen the first two show day, and an almost to last performance, the spectrum of performances, the changes across the run are fascinating to consider. James McArdle’s Louis is as intelligent a performance as in London, taking on the most difficult (in every sense) character in the play with finesse. He’s grown into the character further- helped by a change of Joe with which to experiment more in this run. But he’s also settled into the role, it feels more organic. In London his speech was by the book- literally- his pauses and affectations of speech following the punctuation of Kushner’s writing to the letter. It worked, was genius in fact because Kushner’s genius is to write the character into his words so precisely. But now McArdle has grown his Louis into something more organic, more his own. And it works wonders. He is still neurotic, and difficult but he feels also more vulnerable, more confused and so more endearing- a hell of a challenge for a character like his. As above, Denise Gough has also shifted, what was an already incredible performance into something new. It feels a more settled Harper as well, calmer yes, but also one settled into the performer to push her further. We get more of Harper this time, more of who she was and who she could be woven into the performance. Her humour also- laughing with her not just at her wilder antics-is a crucial part Gough is now bringing out. And a quietness, and stillness that for Harper in contrast to the flights of fancy is so important in understanding her character. Gough’s triumphant moment however is always when she sits alone on stage and delivers the ‘Night Flight to San Francisco’ speech. Again, a moment of stillness in Perestroika’s ceaseless energy. She quietly pulls an audience back in after all they have seen and sends them on their way. 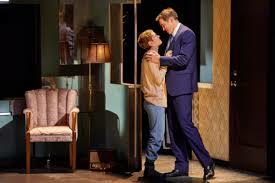 Amid all the bigger parts, Susan Brown is still doing incredible, often overlooked work as Ethel and Hannah. Both seem to have gained a cheeky, funny edge since their time in New York and it’s joyful to watch. Although both serious characters, they are often in ridiculous situations, and the humour that Brown brings brings a slice of realness to even the literal fantastical moments. Her Hannah still has a real emotional core that it’s easy to overlook. Her scene with Prior in the hospital is one of the most moving in the play and again comes out of an actor who knows the power of quiet and stillness in a performance. Meanwhile Ethel Rosenberg- the real-not-real-ghost-not-quite remains a force to be reckoned with. Holding both dramatic and comedic own alongside Nathan Lane is no mean feat, but Brown manages and then some- they’re a well-matched pair and their Ethel and Roy strike the balance of humour and darkness the story commands. And a nod to being in New York strengthening the twang of Ethel’s accent somewhat too. Finally, Andrew Garfield’s Prior. It’s hard to describe without sounding dismissive of his earlier performances, but his seems the biggest evolution. And that is on top of an already accomplished performance. His Prior now seems actually older, more measured than previously. And there is a balance there- while in early performances he started “high” on the emotional scale, and was left with nowhere to go, there is now a more tempered approach. It gives him places to go on Prior’s ‘journey’ which isn’t linear and is often nonsensical from an emotional as well as narrative perspective. Garfield has embraced that, and he now moves- to quote Prior ‘with elegance and grace’ through the play. He isn’t afraid to let the Queen inside Prior out when needed, but she’s now deployed to full effect, and when needed rather than always bubbling beneath the surface. His real strength as an actor in this role is a comedic sense of who Prior is. He brings out the wit and charm of the man we never meet in this play- the pre-AIDS Prior, and those moments shine. A look or an inflection taking a line and rendering it hilarious in the face of the darkness- that gets to the root of the character, and that’s what make Andrew Garfield’s Prior special. Over the run he’s honed down to that, he pulls the tragedy, the vulnerability sure- and he isn’t afraid of that, it’s not coated in anything or reticent at all. And what he may lack in a darker edge to Prior, is balanced by the humour as a weapon. It’s the same side of the character brought out in a different way. It’s cleverly constructed, and while he’s clearly at ease in the role there’s a sense the work, even now is ongoing in that. Watching an actor climb the mountain of this role is something to see at any time. Being able to watch them grow it over two years has been something special indeed. The World only Spins Foreword- On London and New York. Audiences will be audiences, but in New York the inescapable feeling that this play has ‘come home’ and that the audience and actors are sharing that experience every single night. There is something inherently theatrical in the frisson of recognition when Harper first spins onto the stage, that feeling of ‘we know her’. Equally the way the jokes land, it must be said is one respect that that Broadway version can outstrip London. From gentle murmurs of recognition to references like ‘Pineapple Street’ to roars of laughter for comments about Ed Koch, it’s clear this play is embedded here. There’s a reason the 90s staging in London featured a glossary of terms in the programme, while the play can be universally understood these little touches add something in New York. There’s also an almost sporting-like rooting for the play, among those who know it and those who don’t, there’s both a cheering with, and cheering on of the play. While British audiences would never rise to the same level of enthusiasm there’s also something moving about a cheer when Prior stands up and shouts ‘I am a gay man, I am used to pressure.’ That sense of being a part of a community in that moment is a powerful thing. But as much as the production has come home, it also belongs to London, and the company- both those that went with it and those who didn’t- who built it there. The history of this play is tied to the National Theatre, and in bringing this, the first Broadway revival that tie has been cemented. And watching this play grow, evolve across two productions has been something special indeed. It’s a rare thing to get to see a play across a couple of versions, where the transfer isn’t, to quote Ben Brantley ‘Xerox revival’. To see the intelligence of a director at work, to tweak, alter and pull together again the same, but a slightly shifted version. That’s the essence of good revival, even of your own production. To see actors grow into roles, to shift in response to new partners, is fascinating. And to see the characters as written also grow with their interpretation. It’s a great thing as an audience member. And of course, for myself, a highly personal, emotional journey. But that requires another essay. I learned from the best after all that some stories are best told at length, and in two parts. And, of course, that the second part is often messy, and emotional.